THE VENICE CARNIVAL: I am sure about 75% of those who read this have heard of it and I'm sure a high percentage of that knows or has heard how AMAZING the annual carnival is. Well I had heard of it and heard how amazing it is. I may be a tough critic, but I was thoroughly disappointed. I have never heard of the Verona Carnival and it was 1,000,000 times better. After going to Verona during the Valentine's Day Carnival and based on how much fun I had which I am sure all of you realized by reading my previous post; I felt like it would be nearly impossible for Venice to compare. I will explain my reasoning momentarily. It was second class and unlike the Regional train my friends and I took to Verona, was much warmer. These Irish guys are from Dublin and were hysterical. I don't know if I appreciated their accent more or the fact they swore as much as I do. They apologized almost right off the bat and warned me that they swear a lot. I reassured them it was not a problem; I do not think they knew what they were in for ha. They pull out of their plastic bags some beer called FinkBrau Pils. Each one was 330 milliliters. They had 24 of them and costs a total of like 4 euro (6 USD) or something insanely cheap. Their goal for the 5 of us was to drink them during the 2 hour train ride which was not a problem considering we had 2 Irish guys with us. We cracked jokes the whole time and got more acquainted with each other. It seemed like no time when we got there. We walk out of the train station and right away you see the mass amounts of people (mostly wearing masks), the sun shining on the water-filled streets, and the attractive buildings. It was rather breath-taking because of the crowd and the fact that it is VENICE. You hear your whole life about the water-filled streets and what not but never expected to really be here. 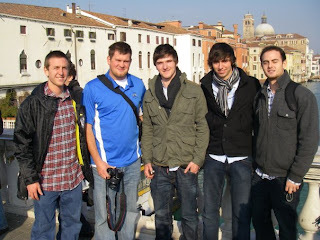 John, Dave, Vince, Connor, and myself just walked around aimlessly really although slightly targeting St. Mark's Square where the big event was. We grabbed some pizza, surprise surprise, and continued our adventure to the Square. The streets became narrower and narrower and you honestly had to put your arms up and bulldoze through the people-riddled streets that were honestly the width of a SmartCar at best. After walking over a few small bridges crossing a "canal" we finally saw a closeup view of the Gondola as you see below. I did not get a chance to have a ride in one, but I am just glad I got a good picture of it as you see below. 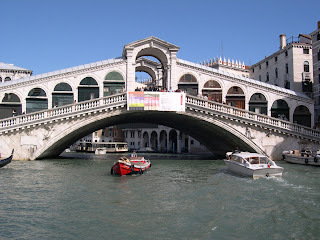 We then saw the famous bridge of Venice; the Rialto Bridge. It really was quite impressive and was the most structurally sound and impressive bridge I have seen here in Italy. We made our way up the bridge and had a great view of the main canal. The water was so busy with boats and gondolas that some were crashing into each other (no harm done). We snapped some photos and continued towards St. Mark's Square. After about a 35 minute walk we got to the RIDICULOUSLY packed Square. There had to have been 80,000-100,000 tourists there. In the Square we saw the famous St. Mark's Basilica. The architecture was extremely impressive as this cathedral was MASSIVE. Take a look at the picture below. Some people went in and were standing on the balcony above, but we did not have much interest and wanted to look around. In Paizza San Marco also rests Doge's Palace, St. Mark's Clocktower, and St. Mark's Campanile all which you can see on my website at photobucket.com. We walked through the Square to the water where we saw San Giorgio Maggiore (an island of Venice). On this island lies the Church of San Giorgio Maggiore (imagine that!!!) that was completed in 1610. It was probably the most beautiful building I saw on this entire trip. I do not know if it was because of the panoramic view with the water and church together or the idea that it has a completely white facade with a tower attached or what. As you can see, the entire Island, Church, and View is unforgettable...unfortunately, this was probably one of the two best parts of Venice. I texted my friends who were there and told me they were near these blue curtains or something which we could see from where we were. Everyone was crowded in an area in front of the Basilica watching all of these people wearing RIDICULOUS outfits. I mean I swear to god these outfits they were wearing were absurd. Some women wore dresses, if that is even remarkably close to what you call these things, that took up probably the whole damn width of the streets I mentioned that a SmartCar couldn't even fit down. Some people appreciate these obnoxious, dressy outfits, but you all can hopefully tell I am not one of them. Apparently the Venice Carnival is ALL ABOUT the masks and these costumes which resulted in utter disappointment in that aspect. Like Verona, I expected silly string, confetti, and total chaos. Instead I get ridiculous costumes, whatever. I am not going to explain anymore of this part because I am getting disappointed and upset while writing this at 2am. The Irish lads brought us to the Irish Pub to watch the France vs Ireland Rugby Match. Ireland got demolished and I hate to be biased towards American Football but it is just soooo much more entertaining than Rugby or Soccer or anything else I have been persuaded or forced to watch. I don't know all of the Rugby rules which makes it a justification for me to not enjoy Rugby as much. I expected big hits and what not but there were not any. They are tough because they do not wear pads and are goin at it but I mean there aren't any huge hits. In football you see guys getting their helmets knocked off, Wide Receivers getting helicoptered in the mid-air, and Quarterbacks getting massacred. I entertained myself by ordering a couple sandwiches and saw some other exchange kids enter and sit in the same corner as us. One of them was a girl that I noticed from my Italian Crash Course who I wanted to figure out what her name was; the only thing I knew was that she is from Connecticut (guys know exactly what I am talking about. Any pretty girl that you see a few times makes you HAVE to find out her name; or maybe its just me, whatever). I finally found out that her name was Nicole, and she was with a couple friends who all ended up joining us the rest of the trip. Before we left the pub a soccer game came on TV and some of them wanted to watch it. Vince, Connor, and I were hungry and bored out of our minds so we went to grab some food. If I had to watch a SOCCER game RIGHT after that RUGBY game I no joke would've deceased of Boredom. Anyways, I bet none of you can guess what we ate! PIZZA!! The three of us split a massive pizza and were still hungry, so Vince and I each grabbed another slice. We went back to the Pub, got the others, and walked around more. They were hungry so they grabbed some pizza. Nicole had an extra slice and kindly offered it to me. I wasn't going to reject that offer. This slice made my pizza count to about 6; what a great day (besides the joke of a Carnival). A few of us then got gelato...mmm!! We heard there was a fire show in Piazza San Marco so we walked back. This fire show, like the parading in the outfits, was a joke. It was simply a couple guys spinning things with fire on the end. It's the same stuff we have all seen in movies and tribal rituals or celebrations; nothing truly spectacular. After this, the square and streets turned into a MONSTER party. It was pretty sick (cool) actually. There was like a 5 minute parade but I wasn't going to complain because it was a lot better than those costumes. This parade and a sudden crazy party pumped me up and encouraged me to put on my cheap mask Nicole gave me. This is shown below! We met some people, danced around with all of the tourists and locals, and let the time fly by. There was another Bocconi group/trip that had a "fleet" of 4 buses of Exchange students so we figured we should try to get on and not pay for a train back to Milano. The bus was scheduled to depart at 245am. The main 5 of us really did not feel like staying up ALL night to catch the first possible train to Milan departing from Venice at 530am. We snuck on one of the double-decker buses, Vince and myself on the bottom and Connor, Dave, and John went on the 2nd floor. Of course with our luck, one of the trip advisors did a name check for everyone on the bus. We had heard a couple girls got sick and what not so Vince and I got our name on the list. We were on the bus for what seemed like forever because they said if people on the list come they will kick us out and blah blah blah. The whole time all we could think was that we are gonna get kicked off and we would have to take a taxi to the train station and stay up all night in the cold and what not. Finally around 345am the bus doors closed and we were SAFE to go home!! Thank God! Vince, Nicole, and I had a very interesting conversation nearly the entire 3 hour bus ride. We made it back to Arcobaleno around 7am and I slept until about 5pm the same day. Overall it was a good trip. The Venice Carnival itself was rather boring and disappointing but Venice was beautiful detailed with famous, architecturally beautiful buildings. The pizza and gelato was great, the party in the streets at night was fun, and I finally found out the name of the pretty girl from Connecticut! Any questions or comments email me at Reynos4@rpi.edu, I will reply ASAP. Also, my next post won't take very long to write because I am trying to catch up. Also, my mom told me its National SONS Week! I find it ironic that Mothers and Fathers get a day but we get a week!! Ciao!